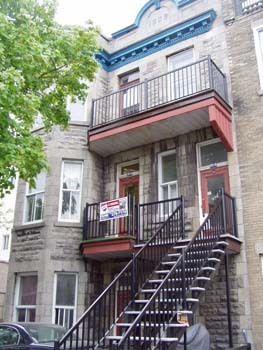 Alan spent his last years in Montreal in the top-floor suite here, a 1909 house that Mordechai Richler visited during the filming of 'The Apprenticeship of Dudey Kravitz' and deemed just like the slums of his youth. In 1976, the building (all 3 suites) was sold for $15,000; the following July 1st, Alan was evicted so the new landlord could give the suite as a wedding present to his daughter... the result was Alan's move to Vancouver. But that's another story! Notice the For Sale sign. I hear they're asking $599,000!